An original Aqua-flo XP2e wet end fitted to a quality US Motors smooth body pump motor. Smooth body motors are best used when space, height in particular is an issue. This hot tub pump will directly replaces the older XP2 version, usually fitted with smooth body motors from Emmerson or AO Smith. 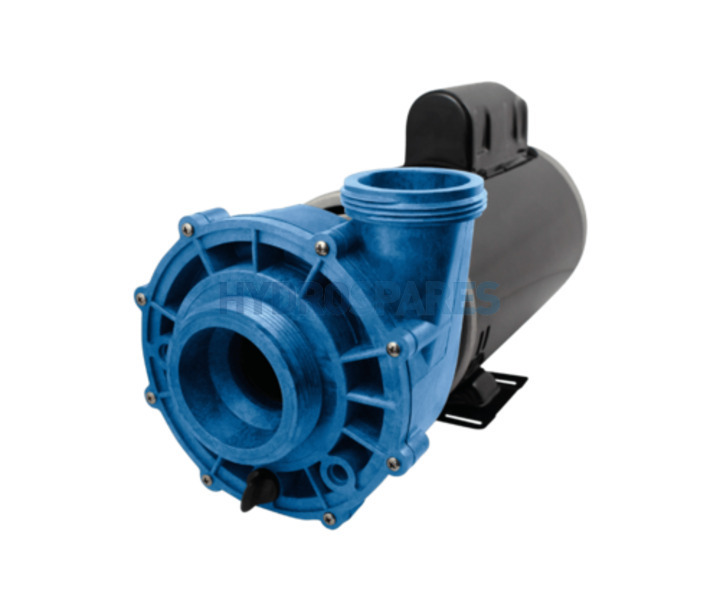 The XP2e range of pumps are also suitable replacements for other bands of pump with 2.0" intake and outlet connections, such as Waterway, Sta-rite and Vico. The Aqua-Flo by XP2e pump is designed for today's large spas with multiple jets requiring increased flow. The XP2e pump fits within the same envelope as the original XP2 pump, yet provides greater flow than its predecessor with its high volumetric volute design and high performance impellers. This allows spas to use more jets per pump while still operating at a whisper quiet noise level. The energy consciousness of the XP2e pump allows for the same and greater flow rates while improving the overall energy efficiency of the spa, reducing consumer operating costs. The XP2e pumps are supplied without a cable. We recommend re-using the cable from your old pump to ensure correct fitment to your spa pack.